The setup is simple, using readily available hardware and software for motor control and streaming video. The rover consists of a Raspberry Pi in an enclosure sitting on top of a tracked chassis. Low voltage motor controllers are driven by the RPi GPIO pins controlled by REST services called from a control webpage via JQuery. Meet Dragon. Streaming video top. Controls, bottom. 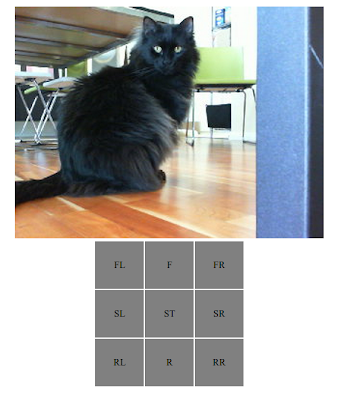 A web cam provides visual feedback using mjpg-streamer visible on the control webpage. 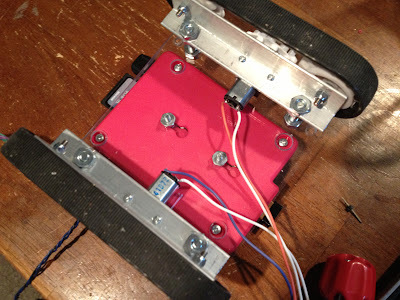 The rover runs off of a 3600mAH NiMH battery feeding into a switched 5V regulator board. The RPi uses a wifi dongle for LAN communication. 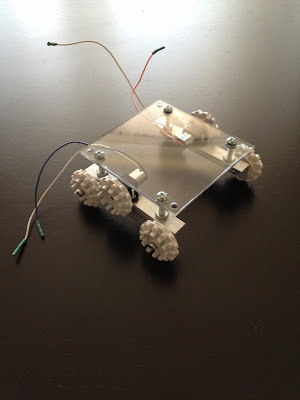 Let's start building the Raspberry Pi robot from the bottom and work our way up. 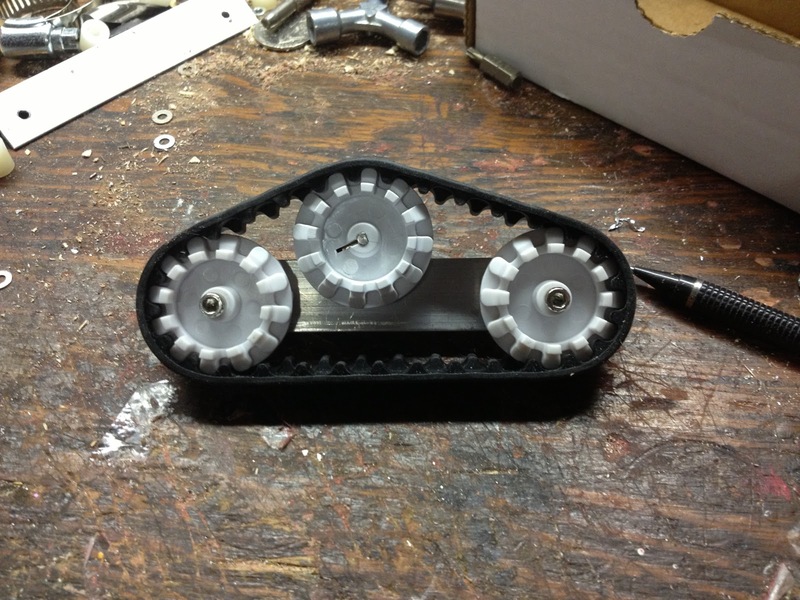 The chassis is built on the Pololu 30T track kit. It comes with tracks, a pair of idler wheels and a pair of drive wheels. I added another pair of Pololu idler wheels and mounted the idlers on short sections of aluminum L stock. 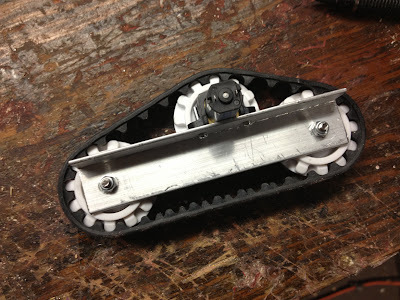 The drive wheels are mounted onto 150:1 Pololu gear motors which in turn are mounted to the top of the L stock with Pololu motor mount brackets. Solder 6" wires on the motors and attach female crimp connectors (Newark: Multicomp 2226TG) on the ends. I assembled each side independently, then cut a Lexan (polycarbonate) base. How do you cut polycarbonate? Carve a straight groove with a wood carving tool (like one of these) and a straightedge, then bend it in a vise for a clean break. Mount each aluminum L channel to the Lexan base with 1" long #10 screws and nuts. Extra nuts raise the base above the motors. The RPi is enclosed in an injection-molded plastic case from Cyntech which I consider to be one of the prettiest, nicest-looking plastic cases made for the Pi. It comes in several colors. Attach the Cyntech enclosure to the base with its built-in slotted mounting holes. Drill holes in the four corners of the polycarbonate base so you can access the enclosure screws. A Pololu DRV8835 motor controller handles the tricky task of driving the motors. Install 0.1" pin headers on the board. Using Pololu's diagram, insert your motor wire crimp connectors into a 4-way housing (Newark: Multicomp 2226A-04) and plug the assembly onto the motor controller board. The robot runs off RC Car batteries like a Reedy Wolfpack 3600mAH NiMH battery. Why antiquated NiMH battery technology? Because I happen to have an automatic NiMH charger that I plan to hack into a docking station. Drive the robot up to it and charging begins. Cut off a few inches of a micro-B USB cable, strip the wires, and connect the power wires to your regulator board output. This cable plugs into and powers the Raspberry Pi. For powering the motor controller, cut a 3-5" length of black and red wire respectively, add female crimp connectors, and insert into a 2-way female housing (Newark: Multicomp 2226A-02). Plug this assembly into the VCC/GND pins on your motor controller board. To secure the battery, mount a section of 1/2" x 1/8" aluminum bar stock underneath the Lexan base longitudinally. Use 3/4" #10 screws with an extra nut next to the Lexan to create a gap between the bar stock and the base. The gap is required so you can use velcro straps or elastic cord to secure the battery. You'll need nine 4-6" wires with female crimp connectors on both ends of each wire. Six of the wires are for the motor controller. One is for 3.3V motor power (the motors don't draw much current), the other five are for control. The remaining three are for serial communications. If you have a Revision 2, you'll need to use GPIO27 and tweak the software accordingly. Serial comunications is really handy. I use a Sparkfun 3.3V FTDI breakout board with 4 pins: 3.3V, TXD, RXD, GND. Insert one end of the remaining three wires into a 6-way female housing, the other end into a 4-way female housing. You'll connect the wires from RPi to FTDI Breakout as follows: GPIO 14 to RXD, GPIO 15 to TXD and the nearest RPi GND pin to FTDI GND. 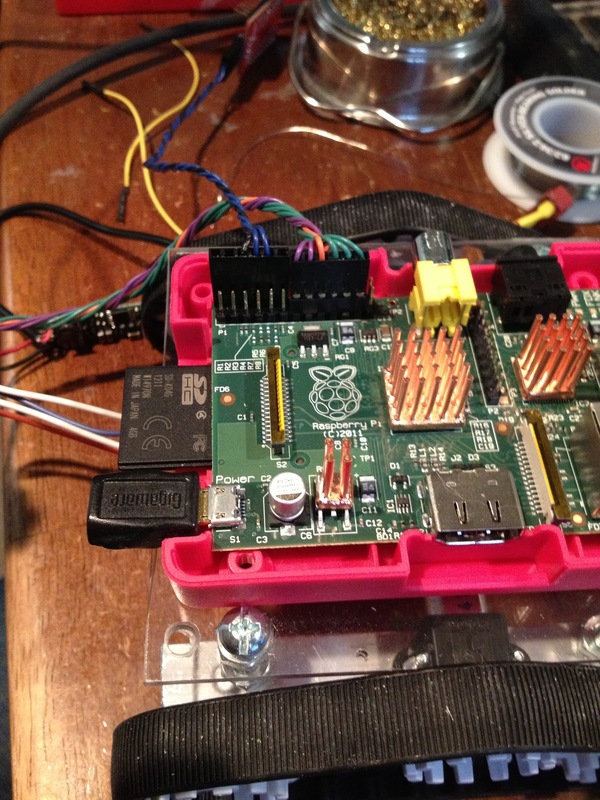 Now that everything's wired, you can set up the Raspberry Pi. You can connect a monitor and keyboard or you can set it up using your FTDI connector and a terminal emulator on your PC. I used a standard Raspbian Wheezy distro. I installed an EDIMAX USB wifi dongle for wireless connectivity and I configured it with a static IP address. You'll need to install webiopi and mjpg-streamer. Now that everything's wired up, and the Pi is set up, it's time for software to take control. I've made the entire source available (see below) so you can just download it and put it in place on your Raspberry Pi. The DRV8835 motor controller uses a mode pin and four PWM pins. Details on how to use the board are found on the product page. 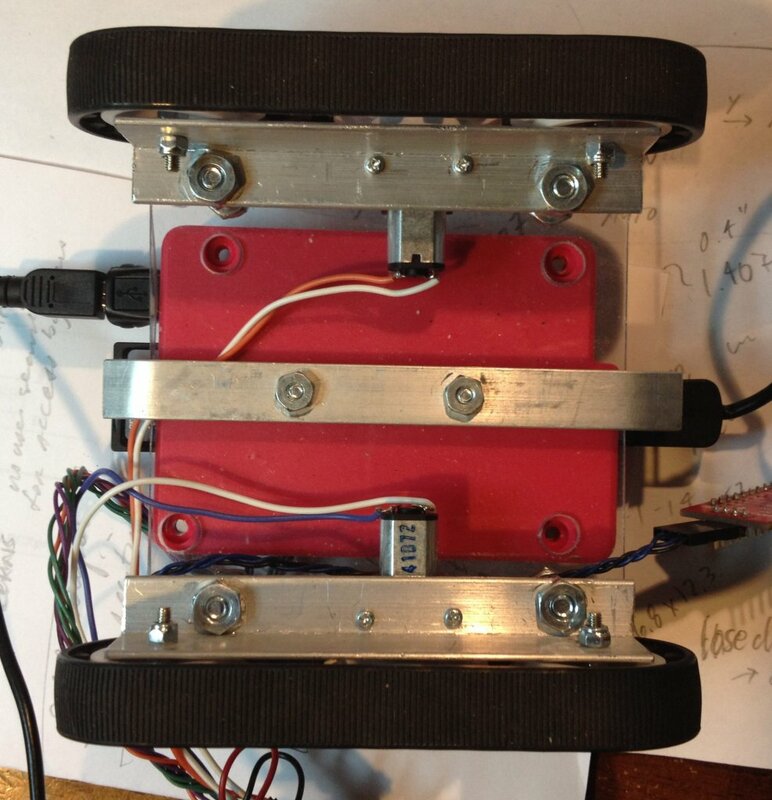 I'm using webiopi to control PWM on the four motor GPIO pins to move the robot. Here's how it works. The web page includes rover.js which I wrote. It contains jQuery functions for controlling direction: fwd(), stop(), spinLeft(), spinRight() and rev(). These functions are called when control buttons on the web page are clicked (more on that momentarily). In turn, these functions call the appropriate webiopi functions available by including webiopi.js. Webiopi jQuery functions call REST services to set PWM parameters on the GPIO pins. Here's an example of how I'm calling webiopi from within the direction functions. The web interface has an HTML table with cells forming buttons for each of the available directions (forward, reverse, stop, spin left, spin right). We use jQuery to detect when those buttons are clicked and call our jQuery direction functions. But our table cells aren't buttons. Normally, clicking a table cell doesn't make it blink. Also, double-clicking a cell will select the contained text. We can make the cells act like buttons with a little CSS and jQuery. The following CSS disables text-select in popular web browsers. The following CSS makes the entire text cell change color from grey when you click on it. Every cell is given a class of "button". Now, bind mouse events to the cells and call our jQuery direction functions when those events occur. On desktop/laptop web browsers, one uses the mousedown and mouseup events to detect mouse clicks on the buttons. Browsers on the iPad and iPhone first fire touchstart and touchend events when you press and release a button and then they fire mousedown and mouseup. If you don't disable the mousedown event, the Rover will move, stop, then move briefly again as if you clicked the button twice. Examples of our direction functions, fwd(), rev(), stop(), spinLeft() and spinRight() can be found above. 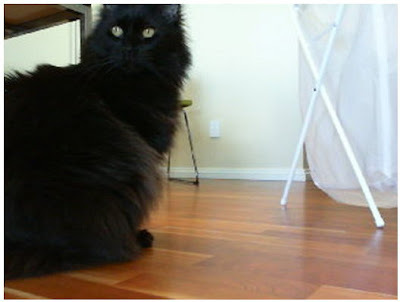 Streaming video originates from a Microsoft LifeCam HD-6000 with it's annoying, unnecessary autofocus disabled. The web streaming is made possible with MJPG-streamer. It runs its own web server on the RPi. My control page simply includes an IMG tag: <img id="streamimage" src="http://192.168.0.4:8080/?action=stream" /> to display the streaming image. The camera is mounted with double-sided tape to a section of aluminum bar stock I bent into an L shape. That in turn is mounted to the RPi enclosure. In addition the docking station I'd like to add servo pan/tilt for the camera, battery meter circuitry so the RPi can display power statistics on the control page, streaming audio so I can hear what is going on. I'd also like to be able to speak through the Rover. If you liked this article, pass it on via redit, twitter, Google+, etc. Thanks! Thanks for the question! I added more details turning this article into more of a tutorial than show-n-tell. It includes connectivity between RPi and DRV8835 motor controller. Magnificent! We are starting a Robotics club and this should wet everyone's appetite. It beats the usual media centre use for a Pi, and combines some nice features. Thanks! What seems to be the problem? Click on the "contact me" link at the top of the blog if you want to email me. which language used to control motor from website? how to configure website+raspberry pi wireless? Hi, thanks for the details, but I have 1 question, where is GPIO 21 that is connected to BIN1/BPhase on Raspberry Pi? According to the link you gave, I don't see GPIO 21, can you help me with that? For Revision 1, it's the in next to GPIO22. On Revision 2 you'll have to use GPIO27, apparently, which means tweaking hte source a bit. (http://www.megaleecher.net/Raspberry_Pi_GPIO_Pinout_Helper). I'll update the article. Oh, thank you. What do you mean by tweaking the source? An example maybe? command in HTML works fine too. I am wondering if there is another part of configuration that i omitted someplace? For example are you using a python script to drive any of this html/js code? Any ideas appreciated! how can i make the code of raspi from the beginning ? ?